At the Last Supper, Jesus announces that His betrayal by Judas begins an outbreak of God’s glory. How can this be? 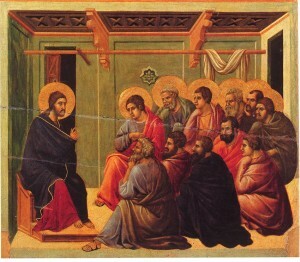 St. John tells us that after Satan had entered Judas, driving him out into the night to report to Jesus’ enemies (see Jn 13:21-30), the Lord began to speak in an unexpected and baffling way: “Now is the Son of Man glorified, and God is glorified in Him.” We know that Judas’ betrayal led to Christ’s Passion–violent brutality, suffering, and a shameful public death. How could all that be described by Jesus as a glorification of both Him and His Father? The answer is anticipated in what Jesus says next: “I give you a new commandment… As I have loved you, so you also should love one another.” Although Christ’s Passion had the appearance of failure, defeat, and impotence, it was, in fact, a revelation of God’s love for man that far exceeded anything man had ever before or ever will see. God’s glory was revealed in the total self-emptying of Jesus on the Cross for love of us, doing for us what we are helpless to do for ourselves. Jesus submitted to great darkness and was thus able to conquer it. He emptied suffering and death of their sting. The “glory” of God is that even in the human circumstances that seem most devoid of His presence and care, God is at work to overthrow appearances and reveal His love for sinners in all its brightness and power. Possible response: Lord Jesus, help me see the small ways that my self-denial out of love today can be a flash of Your glory in this world. We will better understand this reading if we know its context. Paul and Barnabas, on a missionary journey, visited a town called Lystra. There they healed a crippled man. The people were so amazed by this that they tried to worship the apostles as gods. Instead, of course, Paul preached the Gospel to them. However, some Jews who had opposed Paul in other cities he had visited (Antioch and Iconium) followed him to Lystra and provoked the people there to stone him. Thinking he was dead, they dragged his body out of the city. Yet “when the disciples gathered about him, he rose up and entered the city” (see Acts 14:8-20). Remarkably, this episode gives us a living picture of how the early Church actually fulfilled what Jesus spoke in our Gospel. Paul and Barnabas faithfully preached the Good News. Darkness closed in on them, as the Jews stirred up murderous hated. The violence against Paul was so extreme that his enemies believed they had killed him. The believers, looking beyond the darkness they saw, very probably prayed for him as they drew near his seemingly lifeless body. Miraculously, Paul “rose up,” as Jesus had done in His darkness. Glory! Then, amazingly, Paul “entered the city” again. Why would he go back to a place of such hostility against him? 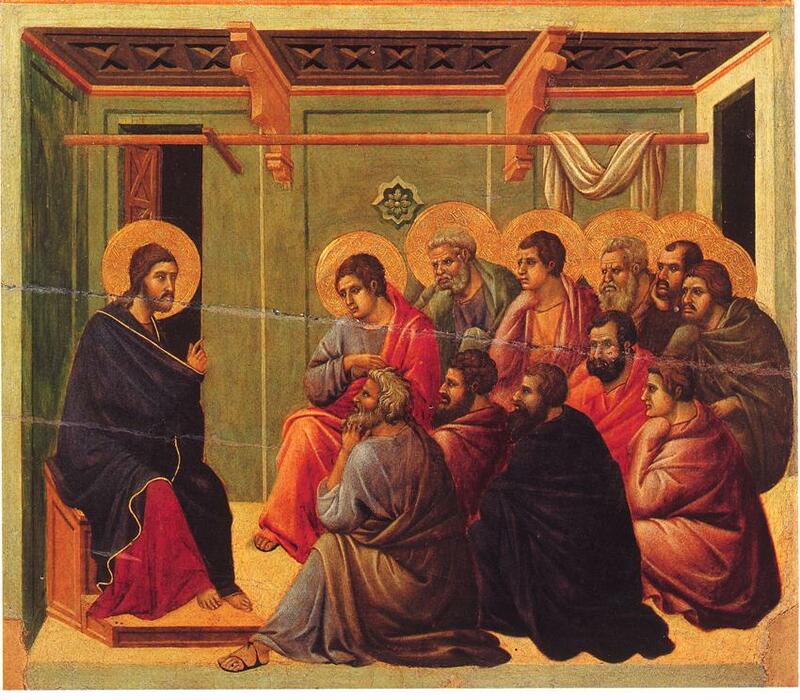 He still wanted to preach and to teach those who had believed in Jesus. This is the love of the “new” commandment, a self-emptying for the sake of others that is beyond what is naturally possible for man. In the verses included in our reading, we see Paul continuing on to the next city, and then he returns to Lystra, Iconium, and Antioch. Although all these places were full of danger for him, he wanted to strengthen “the spirits of the disciples and [exhort] them to persevere in the faith, saying, ‘It is necessary to undergo many hardships to enter the kingdom of God.’” This is the same kind of glory Jesus had described, isn’t it? Far from being signs of God’s disapproval or indifference, earthly affliction opens the way to heavenly glory (see Mt 5:10; Rom. 8:17). Possible response: Lord Jesus, help me be as fearless as St. Paul in doing Your will, no matter what the cost. We ought never to forget that although in this life we will shed tears, someday God Himself will “wipe every tear from [our] eyes.” Glory! Possible response: Heavenly Father, thank You for Your promise to make all things new. This is our ray of hope in every darkness.